You can create rules and conditions to build a dynamic form. Form Rules allow you to trigger an action after someone submits your form. You can redirect people to another site, create a customized confirmation message, or send an email—only when they meet your conditions. Click the purple tab for Form Rules. 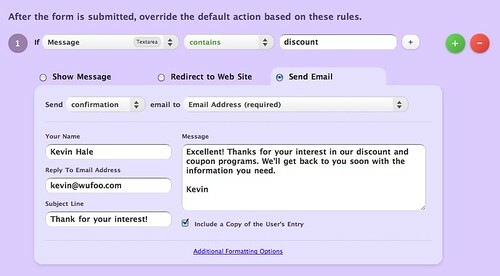 Choose an action: Show Message, Redirect to Web Site, or Send Email. TIP! Form Rules only trigger when certain conditions are met, as opposed to standard confirmation emails or confirmation options that occur whenever someone completes your form. Form Rules override those standard confirmation options, allowing you to have both general confirmation options for most people and specific confirmation options that only trigger in certain cases. Form Rules are only available on paid plans. Displays a custom confirmation message when someone completes your form that only triggers when the condition is met. If the condition is not met, they'll see your standard confirmation option. By default the message is center-aligned, but you can use HTML to left-align the text, as well as add formatting, images, or links. You can also use Templating to insert form data into your custom message. Sends people directly to a website of your choice when they complete your form, only when the condition is met. If the condition is not met, they'll see your standard confirmation option. You can use Templating to pass the Entry ID into the redirect URL. Choose between a notification email (sent to any email addresses you want) or a confirmation email (sent to the email address entered in Email field by the person who filled out your form). Send notification emails that only trigger only when the condition is met. If the condition is not met, your standard notifications take over, if you have them set up. If you have an Email field in your form, you can toggle from "notification" to "confirmation" to send confirmation emails that only trigger only when the condition is met. If the condition is not met, your standard confirmation email takes over, if you have one set up. You can edit the confirmation email in Form Rules the same way you can edit it in Confirmation Options, except you can't add a cc or bcc to confirmation emails set up in Form Rules. You can create multiple Form Rules if you have a few different confirmation scenarios you'd like to set up. If you add multiple Form Rules, your form can (1) both Send Email and Show Message for the same form submission or (2) it can both Send Email and Redirect to Web Site for the same form submission. But it can't both Show Message and Redirect to Web Site for the same form submission. If any Form Rules conflict, your form will only follow the rule that comes last (the higher number) in the list. In the example below, we would follow rule 2 (Redirect to Web Site) but not rule 1 (Show Message) because rule 2 comes after rule 1. We'd also follow rule 3 because we can do both Send Email and Redirect to Web Site. Form Rules allow you to trigger an action after someone submits your form. You can redirect people to another site, create a customized confirmation message, or send an email—only when they meet your conditions.